Surge Protection for serial and Parallel systems, supplied by Unitech Electronics Pty. Ltd.
NO MINIMUM ORDER QUANTITY - Order 1 SurgeZapper per cable or order as many as you need ! Designed, Developed and Manufactured by Unitech Electronics Pty. Ltd. Sydney., Australia. Excellent protection against spikes on serial line. Easy to install, approx 5 minutes. Compact simple to use in-line design. All 8 data lines are fully protected, 9th is ground. Totally 100% hand assembled and tested for reliability. procedure after being encased and sealed and then finally packaged,   ready for retailing. cable to earth, thus ensuring that the console computer equipment is fully guarded against spikes. wire number 9 is ground (earthing). All eight wires are fully protected. 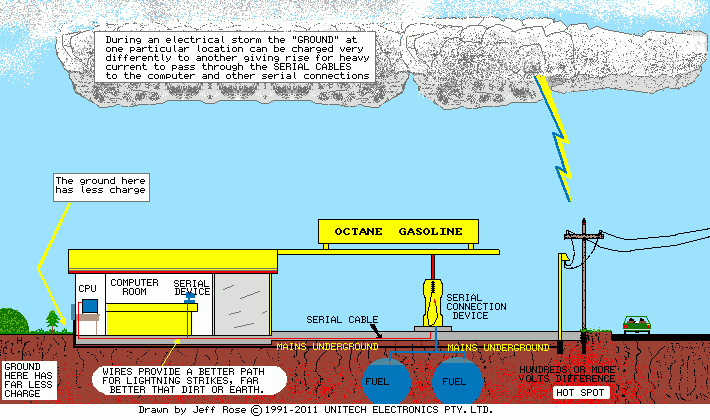 The green wire must be attached to a very good ground (earth) source for the protection to work. Do not connect nor remove a Surge-Zapper with the system live. You must "power-down" both ends. patently obvious, however it will absorb the impact of localized static and spikes and ground EMF. then please let us know ! The 12 months warranty on Surge-Zapper cover defects in assembly or manufacturing only. OK ..... Where would I use a "SURGE ZAPPER" ? out by such a strike, thus keeping your "business income stream" flowing without any serious down-time. protected and mains filtered and have a reliable standby uninterruptible power supply unit power. Note, here again we designed this with all 8 wires each individually surge protected, wire 9 is ground. 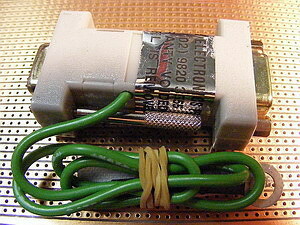 The thick green wire must be attached to a very good ground source for the protection to work. This may require the addition of an earth spike, preferably near a "dampened" area for the best results. A Final reminder " Never connect " nor remove a SurgeZapper with the system is live even at any end. Designed, Researched and Manufactured and fully hand assembled By Unitech Electronics Pty. Ltd.
A parallel version " Surge-Zapper " will be available soon, subsequent to satisfactory Q.A. testing. WHY IS MY EQUIPMENT ZAPPING ME ?